The University of Western Australia offers a wide range of programs and activities aimed at encouraging Aboriginal and Torres Strait Islander secondary students to complete Year 12 and pursue further education at university. The School of Indigenous Studies (SIS) Outreach Programs introduce students to university life and include hands-on activities, meeting tertiary student role models, learning about university courses and making decisions about their future education with the guidance of staff at the School. These intensive programs involve students staying at one of the university colleges on campus or at some other residential camp which allows secondary school students to make friendships with other Indigenous students who are also considering tertiary study, while also experiencing university life including attending lectures, labs and meeting university staff and Indigenous students who are currently studying at UWA. 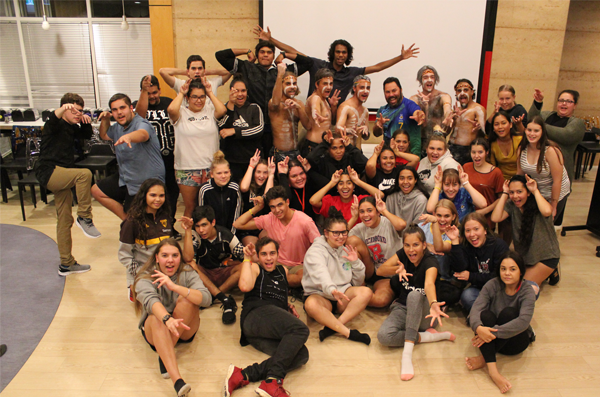 This seminar is a five day residential camp, previously held at Point Walter Recreation & Conference Centre but now staying at Clontarf Aboriginal College, Ngulla Mia Boarding Facility during April school holidays. The Year 12 Seminar introduces students to the range of courses available at The University of Western Australia. Students visit numerous faculties and departments to learn more about the courses in which they are interested - Sports Science, Medicine, Dentistry, Law, Arts, Architecture, Psychology and Engineering have been some of the courses that have been explored on Year 12 Seminars. Information on applying for university, enrolment, scholarships and support from the School of Indigenous Studies and Student Services is discussed on an individual and group basis. Travel and accommodation costs are covered. Application details are sent to Principals and Follow the Dream Coordinators at all WA schools – however students/parents are encouraged to complete an online application from this website. This residential camp is usually held over five days in the July school holidays. Up until 2010, there were 2 Science camps (one for Science and Engineering; the other for students interested in careers in health). In 2011, both camps were combined. This year we are inviting both year 10 & 11 students who are interested in any area of science. They will explore options in all areas of science, engineering, technology and health. Since 2015, students now reside at the Clontarf Aboriginal College, Ngulla Mia Boarding Facility with travel and accommodation costs all covered. The School of Indigenous Studies sponsors Indigenous students who are in Year 11 and 12 and doing at least 4 WACE subjects and plan to study at UWA, to attend WACE Revision Courses. Students who participate in the July school holidays WACE Revision are also offered accommodation at a residential college for the five days – all costs are covered. They will also have an opportunity to meet with staff from the Future Students Office, Admissions and the School of Indigenous Studies to discuss careers, applications for university admission, enrolments and scholarships. Indigenous students currently enrolled at UWA and graduates will also provide information on their experiences. Students interested should complete an Outreach application form and may also have to complete an application form from the preferred WACE Revision provider. Year 8 students can attend one of three Discovery Days which are held in late November each year. Students will have a one-day experience to introduce students to the university environment through a diverse range of hands-on activities at different departments on campus. This could include testing someones athletic ability like an AFL talent scout, applying plaster to a forearm like a doctor or working out what minerals are used to make a car like a geologist. Information will be sent to schools in Term 3. If you are a teacher that would like information about registering students for this program please email outreach-sis@uwa.edu.au. Staff and students from SIS regularly attend Indigenous Career Expos held throughout Western Australia to provide advice and assistance to anyone considering tertiary study. These expos provide a great opportunity for all people to see first-hand what is available in education, employment and training. Tours of the University provide high school students with a great opportunity to meet Indigenous university students who as role models can discuss the various aspects of university life. Schools are welcome to view the facilities and resources available to students at SIS anytime of the year. Excursions normally take two to three hours and are best suited to mornings. Places of interest to visit on campus include Winthrop Hall, the Sport and Recreation Centre, Residential Colleges, Lecture Theatres, Guild Village and Prospective Students Office. Visits to individual departments to do activities can also be arranged. Staff from the School of Indigenous Studies can also visit students at schools in Perth. SIS staff who work in the Aspire UWA Program will also visit Aspire schools (sometimes with other Aspire UWA staff) in the metropolitan area and also in the Peel, Pilbara, Mid-West and Kimberley regions. The session will be held on during September 2019 at the School of Indigenous Studies, (Shenton House) UWA. Parents and guardians are encouraged to attend to meet UWA staff and learn more about the TISC and university application process and ask any questions relating to university. Each year The University of Western Australia holds a public Open Day which is an opportunity for prospective students, friends and family to learn about all that UWA offers. In 2019, Open Day will be held on Sunday, August 4 from 10am - 4pm. We welcome prospective students, parents and families and hope that you will visit the School of Indigenous Studies in the marquee on James Oval - staff from the School of Indigenous Studies will be available to answer any queries and provide information. You can register online and you will be kept up-to-date and emailed a program when it is available.